Arizona’s indigenous history tells a fascinating tale during our Ancient Ruins Tour. 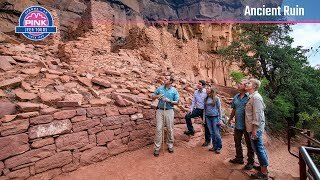 This unique archeological adventure is an up-close look at a time when the Sinagua people called this area home, dating back to the 12th century. Your Certified Interpretive Guide will meet you in Sedona at the Pink® Jeep® Tour Plaza. Get ready: our custom open-air Pink® Jeep® Wrangler is about to take you on a ride you’ll never forget. Wear comfortable shoes, as there is a 45-minute walk on the tour. The mystery of the Sinagua people will surround you as you visit primitive ruins where they lived and worked from 600 AD until the 1400s. Little is known about the customs of the Sinagua, but pictographs and petroglyphs offer a glimpse into their ancient lifestyle. During your visit, you’ll see the 700-year-old cliff dwellings were used for living spaces, community gatherings and burial grounds. Learn how they farmed and hunted, their complicated trading system—and how the society mysteriously vanished. The quandary of the Sinagua has yet to be solved. At the end of the tour, you’ll journey back through the forest and into Sedona, where the rich legacy of Arizona’s native history lives on. No matter which Pink® Jeep® Tour you take next, you’ll never forget the mystique of this ancient civilization. LOVE Tracy! She is amazing!! We are SO lucky to have had her!! Very informative and amazing views. The tour was good, entertaining. When we realized that we could have driven out there on our own, the price of $90 per person seemed a lot. We were able to see some amazing ruins at the Palatki site as well as Montezuma Castle on our own with excellent guides for a lot less money. Great tour with Chris. This was our second tour with Pink Jeep and I wish we had time to take all the others. We will be back! The tour was interesting and informative.